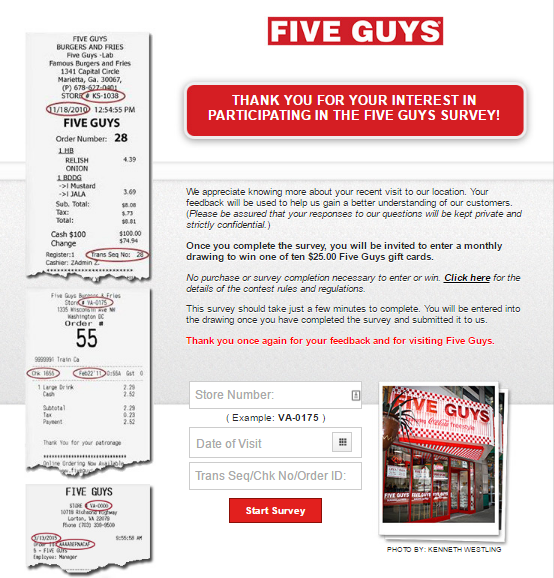 The Five Guys survey is organized by Five Guys Enterprises, which has more than 1000 open locations across the US and Canada. The purpose of the survey is to obtain as much feedback as possible from Five Guys customers, with the aim of improving product quality and customer service. Five Guys is a fast food restaurant chain from the US. It sells a variety of burgers, hot dogs, and fries. 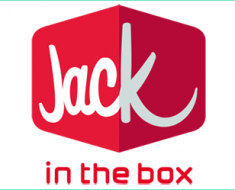 The restaurant chain has seen considerable success in the US and abroad. Starting with only a few locations on the East Coast, it rapidly expanded across the US and Canada. More recently, a number of locations were also opened in the Middle East and in Europe. Participation in the Five Guys customer satisfaction survey can yield prizes and will also contribute to a better overall customer experience, achieved by improving product quality and customer service. At the end of each survey period, Five Guys organizes a sweepstake. The winners will receive gift cards from Five Guys. Participation in the Five Guys survey and sweepstakes can be done online or by post. Let’s take a look at each method in turn. In order to participate in the online Five Guys survey, you must be a former Five Guys client. Participation is very easy. All you have to do is go to https://fiveguysus.survey.marketforce.com/ and follow the instructions. To start the survey, you will have to provide some information related to your last visit, namely the store number, the date of visit and the receipt number. However, according to federal law, participation in sweepstakes cannot be conditioned by purchasing goods or services from the organizer. This law was drafted because, if payment is imposed, then participation would legally translate into gambling. As such, you can also participate in the sweepstake if you are not a former client or if you do not wish to complete the survey. In this situation, participation is done by post. If you wish to participate without becoming a client, all you have to do is send Five Guys restaurant your name, complete address, city, state, zip code, phone number, and birth date on a 3 x 5 card. The address you should send it to is Five Guys “Customer Satisfaction Survey” Sweepstakes Entry, 625 Panorama Trail Suite 2100, Rochester, NY 14625. In addition, there are a number of other conditions imposed by Five Guys regarding participation in the survey. You must be legally residing in the US and 18 years of age or older. In addition, if you are in any way related, or associated, to an employee of Five Guys, then you will not be able to participate in the sweepstake. The survey and the sweepstake are organized on a monthly basis, with twelve survey periods each year. The drawing for any particular sweepstake will be organized no later than the first half of the next month. Involvement in the Five Guys survey is beneficial not only for the restaurant (who usually sees its sales increasing) but also for clients, who get to contribute to overall customer service improvement. Prizes. Each month, ten prizes will be awarded to participants. Each prize amounts to a $25 Five Guys gift card, which can be used to purchase products at Five Guys. During a given survey period, there can only be one price per household. Customer Service Improvement. Participation in the Five Guys customer satisfaction survey should not be done just for the sake of the monthly prize. One of the key elements required in improving customer service and product quality is consistent customer feedback. This is why it’s very important to participate and to answer the questions as truthfully and objectively as possible. A working internet connection. It’s very important to check whether your internet is working properly before you start completing the online survey. If you are disconnected from the internet while completing the survey, there is a chance that you will lose your previously submitted answers. An updated browser. Some websites no not work in outdated browsers, or do not have full functionality. In order to avoid any inconvenience, quickly check if you have the latest browser version and, if not, update it. This is usually done from the “help” tab in your browser’s menu. A Five Guys Receipt. In order to enter the online Five Guys survey, you will first need a valid receipt. This requirement is due to the fact that only a former client can offer relevant answers. If you have not actually tried a product or service, it’s difficult to provide your own opinion on the matter. Make a habit of not throwing away receipts, as they can come in handy every once in a while. Choose whether you want to participate in the monthly sweepstake. If your answer is yes, please provide contact information for communication purposes in case of a win. The Five Guys survey involves you entering some personal data in the survey’s online forms. Five Guys restaurant takes the protection of your personal data very seriously and does not disclose such data with the exception of conditions provided by law. However, to decrease the risk of becoming a victim of personal data theft, make sure you use updated antivirus software and a secure home internet connection. Participation in the Five Guys survey is not just a way to win occasional prizes. Increased participation plays an important role in improving overall customer service. As such, it’s a great way of making your voice heard when it comes to your favorite restaurants and what they can offer.